A gift that can be used for a lifetime, the Psalm 119:105 Tie Bar In Sterling Silver provides a stylish way to remember scripture throughout the day. This tie bar makes a great accessory for formal event wear and everyday office attire. Looking for a matching tie to go with your Psalm 119:105 Tie Bar In Sterling Silver? 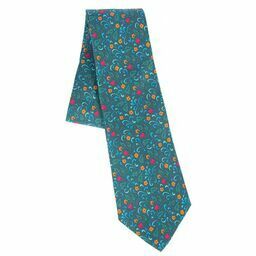 We have many specially-designed ties that pair nicely with this accessory. Check out our 100% Silk Esther Scroll Tie for a meaningful Museum of the Bible exclusive option. This tie bar is made of sterling silver with a polish finish. It measures 2.4" long and weighs 20 ounces. Your tie bar will be delivered within 5 to 7 days from the date of your order. If you’re ordering this as a gift for Father’s Day, a birthday, holiday, or other special occasions and need it faster, we offer rush shipping at checkout. We want you to be 100% satisfied with your tie bar. If you aren’t, you can send it back within 30 days for a full refund (less shipping costs). We have a wide variety of ties, chains, cuff links, and more. See them all by clicking here.